A Delhi court Tuesday awarded death penalty to convict Yashpal Singh and ordered life imprisonment to another, Naresh Sherawat, for killing of two men during the 1984 anti-Sikh riots that followed assassination of the then prime minister Indira Gandhi leaving nearly 3,000 people dead. In the first verdict after the riots-related cases were reopened by a Special Investigation Team (SIT) in 2015, the court held that Singh's offence fell under the "rarest of rare" category warranting the death penalty. The Delhi Police had closed this case in 1994 for want of evidence. The court also imposed fine of Rs 35 lakh each on both the convicts and directed payment of the fine amount as compensation to surviving family members of deceased Hardev Singh and Avtar Singh. 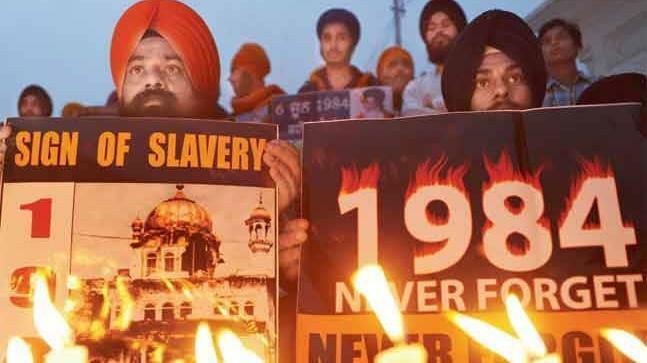 While this is the first death penalty after the SIT was formed, one Kishori was earlier given the death penalty by a trial court in as many as seven anti-Sikh riots cases. However, the Delhi High Court confirmed death penalty only in three cases, which were later commuted to life-term by the Supreme Court. Sikh leaders across parties, including Punjab Chief Minister Amarinder Singh, welcomed the court decision and hoped that others involved in the riots would also soon be brought to book for their "horrendous and inhuman acts". "Convict Yashpal Singh is sentenced to death for the offence under section 302 (murder) of the IPC. Convict Naresh Sehrawat is sentenced to life for the offence under section 302 (murder) of the IPC," Additional Sessions Judge Ajay Pandey said. Proceedings were held inside the Tihar Jail by Additional Sessions Judge Ajay Pandey due to security concerns as one of the convicts, Yashpal, was attacked inside the Patiala House District courts premises on November 15, the last date of hearing. The court directed that the complete original case file be submitted to the Delhi High Court for confirmation of the death penalty. The court spared convict Naresh the gallows while taking note of his medical condition and his lawyer's arguments seeking leniency in the quantum of sentence. Earlier, the court had convicted Singh and Sherawat for killing Hardev Singh and Avtar Singh in Mahipalpur area of South Delhi on November 1, 1984 during the riots that had taken place after the assassination of then Prime Minister Indira Gandhi at her residence by the two Sikh bodyguards a day before. A mob of about 500 persons, led by the two convicts, had encircled the house of the victims and had killed them. It was just one of the incidents out of several others Delhi alone during the riots that saw around 3,000 people being killed. Of the 650 cases registered in connection with the anti-Sikh riots in Delhi, 267 were closed as untraced by the Delhi Police. Of these 267 cases, five were later taken up by the CBI. The SIT also scrutinised records of 18 cancelled cases. The SIT found 60 cases appropriate for further investigation and has filed "untraced report" in 52 cases in the last one-and-a-half years. Out of the eight cases being investigated, charge sheets have been filed in five, while the status of three cases, in which senior Congress leader Sajjan Kumar is an accused, is 'pending investigation'. The Congress welcomed the court order saying it was "proud" that the legal process was being allowed to work out its course. Role of several Congress leaders had come under scanner for allegedly inciting violence during the riots across Delhi and some other places that saw thousands getting killed, raped, assaulted and their homes burnt. Today's proceedings were held inside the Tihar Jail due to security concerns as one of the convicts, Yashpal, was attacked inside the Patiala House District courts premises on November 15, the last date of hearing. A day later, as the convicts were being taken to the lock-up inside the Patiala House Courts premises after the arguments on quantum of punishment, BJP MLA Manjinder Singh Sirsa had slapped Yashpal Singh and slogans were raised against two convicts. Anticipating a law and order issue, the police requested the court to pronounce the order inside Tihar. The SIT had told the court it was "brutal murder of two innocent young persons aged around 25 each. It was a planned murder since the accused were carrying kerosene oil, sticks etc." "People from only one community were targeted. It was a genocide. The incidents had an international effect and it took 34 years to get justice. A signal should go to the society to deter them from committing such horrible crimes. This is rarest of rare case which calls for death penalty," the SIT had said. However, the advocate for the convicts said that the attack was not deliberate or planned but a sudden flare up.